Everyone that tries these cheesy chicken fritters, loves them! They are easy to prepare and very flavorful. The cheese in the batter forms part of the outer crust and a creates an irresistible cheese pull as you bite into these yummy chicken fritters. Marinating the chicken makes it incredibly tender and juicy. You’ll want to marinate 2 hours or overnight; so there’s a make-ahead option! I served them with a really simple garlic aioli dip but these fritters are still super yummy without the dip (see, I highlighted all of the really important points for my speed readers). This recipe is really easy to double if you’re feeding a crowd. 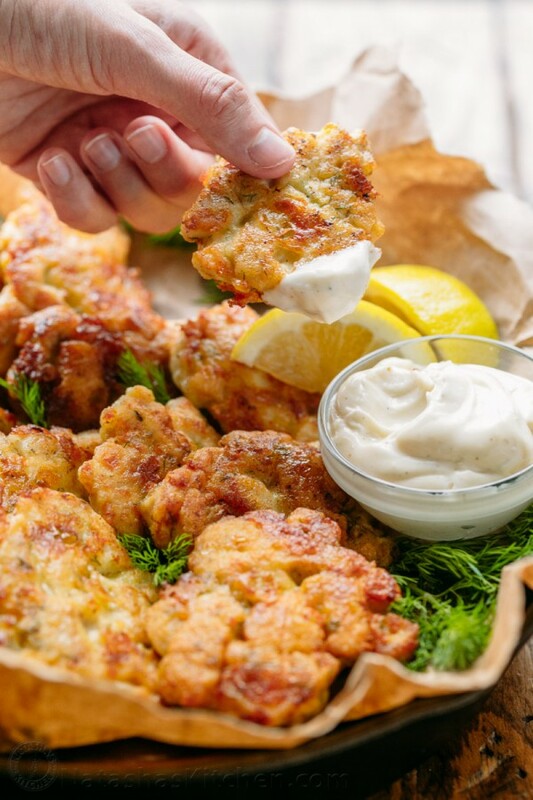 The cheese in the batter forms part of the outer crust and a creates an irresistible cheese pull as you bite into these yummy chicken fritters. Marinating the chicken makes it tender and juicy. Marinate 2 hours or overnight. Using a sharp knife, dice chicken into 1/3" to 1/2" thick pieces and set aside. In a medium bowl combine batter ingredients: 2 eggs, 5 Tbsp mayo, 1/3 cup flour, 1 1/3 cups mozzarella, 1 1/2 Tbsp dill, 1/2 tsp salt and 1/8 tsp black pepper. Stir until well combined. Stir in diced chicken, cover with plastic wrap and marinate in the refrigerator at least 2 hours, or overnight. Heat a large non-stick pan over med heat. Add 2 Tbsp oil and when hot, add the chicken mixture a heaping Tbsp at a time (I used a flat ice cream scoop). Pat down fritters with the back of your spoon to flatten slightly. Saute uncovered 3 - 4 min on the first side then flip and saute uncovered 3 min on the second side or until golden brown and fully cooked. Repeat with remaining fritters. 0 Response to "Tender Chicken Fritters"